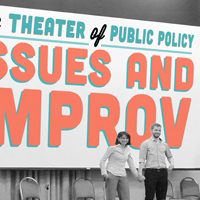 Webster’s Speech and Debate Team and Club invite the community to see visiting instructor Julie Smith and the Theatre of Public Policy improv troupe Tuesday, March 27, at noon in the Library Conference Room. After the interview, the troupe will perform a series of humorous scenes that integrate content from the interview. The audience will get their turn to question Smith, after which the troupe will perform a second set of scenes that once again include content from the audience exchange. The mission of the troupe, which travels to college campuses across the country, is to promote exchange over important issues in ways that are both entertaining and substantive—and that transcend partisanship and dogma. Refreshments will be provided and a door prize will be awarded. For more information, please contact Gina Jensen at jensen@webster.edu. The event is free and open to the Webster and surrounding community.